I'm so excited, I'm a winner! They say you have to be in it to win it and win it - I did! 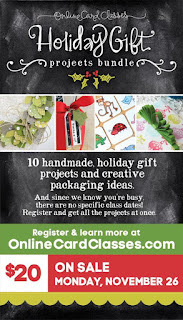 The very talented and lovely Shari Carroll gave us all the opportunity of winning a place on the "Holiday Gifts Projects Bundle" class from Online Card Classes. All we had to do was comment on Shari's blog post, which I did along with 73 other ladies and I was picked as the winner. I had actually registered and paid for the class myself so wrote that if I won I'd be donating my prize to a deserving friend, which I've done and she is absolutely delighted. 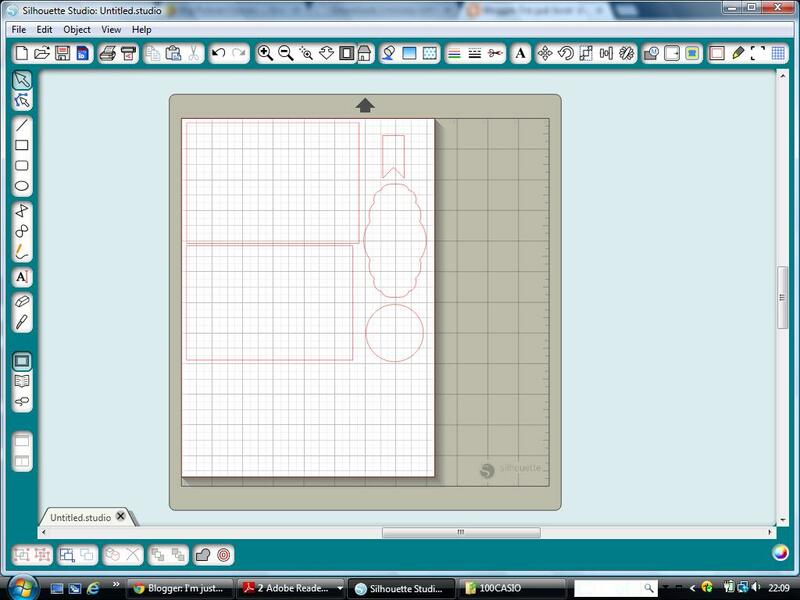 All I have to do now is to start making some of the lovely projects that are shown in class! I'll be back another day to show you what I've made. Anyone interested in any of the Online Card Classes, should definitely sign up for one and try one - they really are fun as well as educational, of course ;) ! Today, one of my friends is celebrating a special birthday. I made her this card the other day, but decided not to post it on here until today in case she saw it! The base colour of this card is Stampin' Up's Certainly Celery, the rest of the pieces of this card were all cut on my Silhouette Cameo using Very Vanilla, you can see the screen shot above. I stamped the top mat with Versa Mark ink, let it dry for a few minutes and then brayered over it with Certainly Celery ink. I used my new Splodge Away mat, which made it pretty easy. I made the label shape myself out of combining two shapes from the Silhouette Studio store by welding them together, which again was cut out using Very Vanilla, which I stamped in Versa Mark and brayered over. The same for the flag shape at the top of the card. I stamped the circle using markers and a Stampin' Up flower from the set called You Are Loved and finished that little section with the Very Vanilla Seam Binding Ribbon. The 60 was stamped and the circle pricked using the Paper Piercing Pack Essentials kit from Stampin' up, then I carefully used a marker pen to highlight each little pricked hole. I then added the finishing touches - faux stitching and 3 little pearls. Happy crafting with your Silhouette Cameo and Splodge Away mat! Just popping in quickly with another brayered card - made easy with the Splodge Away Mat. I was worrying about the card I showed a few days ago which I'd made for my brother-in-law. It didn't have an aeroplane on it and I always try and send him a card with one on! I remembered the saying about only worrying about things we can fix, so I fixed it this morning. Sorry it hasn't photographed all that well, using silver embossing powder and silver mirror card hasn't helped! I used some of my old Stampin' Up stash, and brayered the sky with Baja Breeze ink, using my Splodge Away mat! Hope you get to use yours soon! Have a good day crafting. There was a huge amount of work involved in these cards, now I'm thinking I'll have to buy the rest!!! See you later in the week with one more card, which I did actually make before I started these today! I'm back today with another card, made last night when I'd got everything out on my desk! I worked out a plan and that plan worked so well I was able to make a few cards all similar and I felt they got better the more I made! I've made this card for my brother-in-law. I usually make a card with an aeroplane on as he loves them, but he's got a change this year! Let me know if you like my Splodge Mat brayered cards. I'm back again, with another Splodge Mat card here. With my lovely new Splodge Mat out on my desk, I'm making the most of it and the mess I'm creating as the day goes by! I wanted to send a friend a card, she is going through a tough time and I wanted to show her that I really do care. I can't do much, but I can care! Again I used Baja Breeze ink on Whisper White, applying the ink with my new (to be looked after!) brayer! I stamped the flowers using an old stamp from an old hostess stamp set called Silhouette Sentiments, the other stamp sets used were stamps from Hopeful Thoughts and Sincere Salutations. Oh, and I've added the little "friend" tag on one of the stems using the Tiny Tags stamp set and Jewellery tag punch. p.s. I will be bringing lots of these cards to my crop on Saturday.....be there for the demo, I still have space! I'm getting confident now with this new Splodge Mat and my new lovely brayer (which I promise to take care of)! You can tell I'm getting more confident because the colour I'm using is darker than my last card - lol!!! ..........LOOK ......... no lines, no gaps, no brayer marks, I'm just lovin' it! Anyone might think I'd had Barbara Gray over - ha ha ha !!! Hope my friend likes it as much as I do, it's her birthday next week. I'll be back when I have something else to show you. Have a happy crafty day. What a horrible day outside, the rain is heavy and the gusty winds are scaring me! I'm taking my mind off the weather and onto a couple of cards I wanted to make today. This first one is for one of "my ladies", she has had a hip replacement and I thought a little card from me would put a smile on her face the morning it arrives. After seeing the Splodge Mat on Create & Craft with the very lovely Barbara Gray, I decided to purchase one and have a go. I tried last week with my old brayer and decided a new one was needed, as my old brayer had been used and used for all kinds of things and not looked after as well as it could have been ;) ! The cheapest place to buy your new brayer is still Stampin' Up, so call/email me if you need a new one and I'll add it to my next party order! I found brayering a complete dream with the new Splodge Mat and brayer, you should definitely give it a go! I brayered Pretty in Pink ink on to Whisper White card stock. Very subtle and no extra lines - yippee!!!!! Now lets see if I can make the other card I need ......I might be back later. Have a great crafty day. I thought I'd share with you today what I've made for a gentleman who contacted me about Silhouette Cameo lessons for his wife, for Christmas. I advertise on my blog that I do give lessons to Cameo users in Oxfordshire, but actually if you are prepared to travel to Oxfordshire, you are welcome to contact me about one-to-one day workshops, they might well not be as expensive as you think and you will certainly learn how to use your Cameo more efficiently and cheaply. I have been contacted by people from all over Europe but unfortunately, I can only teach face to face, either at your home (helping you to set up and get started) or lessons at my home bringing your own laptop to use with my Silhouette Cameo. .......this is a picture of the "coupon"
Of course, I made the whole Silhouette Gift Coupon Booklet using the Silhouette Studio Software and the Silhouette Cameo machine! If you think this is a great Christmas gift idea, for someone you love, I can make another one!!! 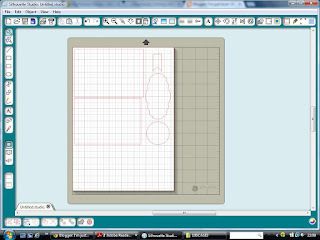 Hope you find some time to craft with your Silhouette Cameo today. I'm back with the other card I made after/during class today :) ! My list of favourite crafters is increasing - Julie Ebersole has to be added to my top 5! I'm showing you two photos of this one! The top picture shows the embossed lines that the Christmas trees sit on and the bottom embossed line but is a little dark. The second photo is brighter, but doesn't show the embossed lines at all! I really loved the technique for making this, even though I needed pigment ink and couldn't find any - as I haven't used it in years, so had to be crafty - but I've been crafting for donkey's years now and know how to get around everything - lol !!! My lovely neighbour Ann, just loves the words on this card by Charles Dickens, so you know where this card will be heading this Christmas! Oh, and just letting you know that if I were to make this card again, I'd definitely place my JOY letters closer, after seeing this photo! Hope you enjoy some crafting time very soon! I can't believe it's day 9 already, until I look around my house and see all the jobs I've been avoiding! ......using a technique called faux metal. I stamped my sentiment image into triple embossed silver embossing powder, something I haven't actually done for a very long time, firstly inking my stamp with Stazon Black. I will be back later with another card inspired from the class today, click on the link on my sidebar if you would like to join the class. Last week I saw one of my lovely crafty friends Maria, she bought with her some Christmas cards that she had made using a Molly Blooms kit to show me. I liked her cards so much I nipped out to WHSmith and brought the kit myself the other day. I brought lots and lots of Copic markers a while back, which were feeling most unloved! I don't consider myself good at using them or colouring at the best of times so I thought a bit of practice was in order! There was a master class on colouring on Day 4 of the Holiday Card Workshop, so with that in mind I decided to have a go. I used paper, button and stamp from the Molly Blooms Christmas Carnival kit, together with Copic markers to colour the image, Martha Stewart and Carl snowflake punches, the dies for the shape are new to me, they are Sizzix Framelits 657914 (Labels, Fancy #5), the thread is from Stampin' Up and I finished off the heart with Distress Stickles. Have a great day and click on the link in my sidebar if you want to learn more about the Holiday Card Workshop. ..........whilst I had that particular Rubbadubbadoo stamp set out (from my earlier card), I decided to make another card using the set and the same technique as earlier. It was really quick, I used 3 different reds from the Stampin' Up range of inks and finished this card off with the little silver circles - oh I wish I knew where I got those from and what make they were! If you know, please leave me a comment - thanks! The middle of the flower has been embellished with Ranger's Liquid Pearls. This is such a lovely set...........I might just leave it on my desk and see if I can use it tomorrow. I got busy yesterday and had far too much to do to be able to craft :( ! I did though try a few things earlier today but I'm afraid, I didn't come up with anything good enough! Sometimes that happens (to the best of us - ha ha ha!!). Well I've had a nap, I napped all the way through the crafting programme with Stephanie Weightman on QVC - whoops! I decided to watch it whilst waiting for my class to come live and that was that. All I can say is, that I must have needed the sleep. I had to photograph this card from above, otherwise the flash hit the glossy card stock and made for an even more awful photo than usual! After applying the three different coloured inks, Perfect Plum, Wisteria Wonder and Elegant Eggplant in a circular motion all over the glossy card stock I stamped the image from an old rubbadubbadoo image, one with a magnetic back, using Archival Black ink. The magnetic back takes me back years and years! I mounted the artwork onto a nice piece of matt silver card stock and then onto my Elegant Eggplant card base. I embossed the greeting using silver embossing powder to finish the card. Very simple, but I like it. Hope you have some time to craft today. I was inspired by Tami's card in the class today. Although the techniques are totally different, I was inspired by what she had made, which lead to this lovely card. For a very long time I've had this Whitewash Coredinations card stock, which needed to be used and not just "loved"! After cutting a piece to size, I ran it through my Cuttlebug using a Cuttlebug embossing folder. I adhered that to a piece of white card stock for a mat and then adhered that to the front of my card. I then cut out the snowman section, through all 3 layers. I put a silver mat behind that and adhered the snowman section to the inside of the card. I then cut out a couple of trees and some snowflakes to finish the card off. I hope you like my cards today and I hope you have found some time to craft too. Right now for "operation clear-up"!!! I hope to be back tomorrow with more cards for you to see and don't forget you can join in this class, just click on the link in my sidebar! this card was inspired by Shari, she had made a card similar to this using a stamp of a star, which was gorgeous. It had lines all over it dividing it into sections, which when she embossed, made great areas to colour. As I'm on a spending freeze and using what I have, I cut this lovely star using my Silhouette Cameo. I cut a plain star for the base and the star on the top which has great colouring sections. I placed the top star onto my craft mat, covered it with Versamark and white embossing powder and heated it. I then stuck that onto the bottom plain star and coloured the sections with my Distress Markers. I then applied Distress Stickles, but wasn't all that happy with the result so I then opted to fill in the sections with Glossy Accents, which makes the star look more like stained glass. I hope you like my card, there is another..............watch this space! Another lovely afternoon spent here in my craft room making my Christmas cards, all inspired by the wonderful creations over at the classroom. A Memory Box die was used for this type of card in class today, but as I hadn't one suitable I cut this image out using my Silhouette Cameo. I cut the image out using acetate, which I used as a mask. I used Weathered Wood Distress Ink, which I sprinkled with water to get the snowing effect. The greeting was stamped and embossed in white onto vellum, which I coloured with the same ink from behind. I used Studio Matte adhesive to adhere the greeting, which looks "snowy" if you look closely! I will be back in a moment with the next card.......... watch this space! I actually started it after seeing this lovely card made by Linda Suarez in the on-line gallery of the Holiday Card Workshop on-line class (see side bar for details). I was definitely missing using my Silhouette Cameo and decided to cut out the shape of this Poinsettia. To do this I download some flower petals from the Silhouette on-line store and manipulated one of the petals to look more like what I wanted. I then replicated the petal five times and fiddled about with them until I was happy with how they looked before cutting them out. I had a real problem finishing the card as I seem to have lost the Stampin' Up stamp set that goes with my tiny little jewellery punch. I had visions of stamping the little word "merry", punching it and tying it on one of the loops at the bottom, but it's nowhere to be found :( ! In the end I finished my card with a little metal heart that says "made with love" on it, which is pretty cute. Right I'm off to search for that missing stamp set! Enjoy your day and I hope you find some time to craft. I've had a couple of days off, with a little too much to do and not feeling all that great, but when I saw the lovely cards made by the very talented Debby Hughes in the bonus class today I was determined to get out my vellum! I am really pleased with how it turned out. I love the word "Joy", it is my favourite Christmas word and each year I use the word in some of my cards. This is another card using product I've had for a very long time, and it makes me want to jump for joy, using it ;) ! Have a lovely week. I'll try and post regularly again this coming week. Don't forget to click on the link in my sidebar if you want details of this great class. Just thought I'd pop in to tell you I'm off skiving from my wonderful class! Yesterday I felt a little weird, a bit heady and sicky and today I woke very early and spent the first hour or two making regular trips to the bathroom. I felt better once I'd eaten, but can't seem to concentrate on anything. I think it's a reaction to the Flu injection that I had on Wednesday. I haven't been out to eat so can't blame that and I'm certainly not going to blame anything I've cooked! So sorry if you are popping by looking to see what I've made in class. I'm off out tonight and then tomorrow is another day and hopefully I'll be back firing on all my cylinders (I mean "both" my cylinders - lol !!!). Hope you managed to make something lovely. I have been having a great week, I've been doing all my jobs in the morning ready to begin the class when it comes in at around lunch time here in the UK. It has worked well and I have felt more or less up-to-date with things. But with so much inspiration yesterday and with getting "on a roll" with those lovely robin cards, which were a dream to make, with the quick colouring technique, I went to bed feeling that I hadn't made a card similar to Shari's! So with gay abandon, I decided to skip the ironing and craft like Shari this morning! The class was based on working on an acetate panel, which I found a little fiddly but definitely worth it. I'm still using supplies I've had for years, the stamped image is one of the first ever Christmas stamps I bought, more than 10 years ago. It had gone a little hard and my lovely friend Maria told me that all I needed to do was to sand it a little, which I did and it stamped really well. The papers I've had for many years too, which I found whilst sorting out some of my old stash, they are from when I was a Creative Memories Consultant, which seems a life time ago! I've used Whisper White card stock, Christmas sentiment and punches all from when I was a Stampin' Up demo - oh how nice it is to use up my stash. I never thought I'd feel so good putting it all to good use! Another card without the Silhouette, I can't quite believe it - lol !!! Have a great day and I hope to be back later with whatever I make from the class today, when it comes in at lunch time. There is one very good thing to know that when you sign up for one of Jennifer and Kristina's on-line card classes you will have access forever! With that in mind, I'm not going to get stressed..............I feel a little stressed that there is so much inspiration bursting from these classes that I don't have the time (or the energy) to make everything at the moment!!! I'm am telling myself to pace myself and when the class is finished I can go back and enjoy the videos again and make the cards that I haven't time for whilst the class is "live"! I actually made 5 cards, the first one I made wasn't the best, but it inspired me to try harder and these were the four that turned out really well afterwards. I might have made more, but my mask was worn out! I really should have treated it more carefully, but at least it was good for five cards! If you haven't signed up for this class yet.........what on earth are you waiting for???? You can follow the link that is now on my side bar to get registered! Thanks to my very busy tech guy for getting that little link on to my sidebar ;-) !